Trench 3 gives us a glimpse into the industrial heart of the Anglo Saxon fortress. The stratigraphy is complex and deep with multiple phases of buildings and industry of all kinds, from high status metalworking, to blacksmithing, and even making mortar for stone buildings. There are cobbled paths and metalled walkways leading to a possible smithy and grand timber halls that span the width of the trench. 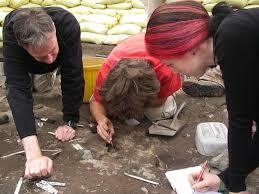 This is archaeology to challenge and delight in equal measure, with all manner of finds revealed on a daily basis. Why did we open this trench? Trench 3 was opened in 2001 in the West Ward as a 30m trial trench designed to locate the edges of Dr. Brian Hope-Taylor’s excavation known from an all too limited series of modest publications. Sadly Dr. Hope-Taylor died before he was able to fully publish the site he had excavated in the 1960s and 1970s, but luckily for us the RCAHMS (now part of Historic Scotland) and English Heritage (now Historic England) were able to retrieve numerous archives, including that from Bamburgh, from his home after his death. This incomplete archive was from another era of archaeology, recorded in feet and inches and with a complex numbering system so very differnt form the context recording methods used today. Even so this is a fabulously important record of this important site and it is vital we interpret the earlier results and incorporate them into our current research. Trench 3 in 2018 with 7th to 8th century AD surfaces and features exposed. The BRP and Hope-Taylor areas are now close to the same level ove much of the trench. In order to properly understand the earlier excavation we devised a strategy to open an extensive new area to the east of Hope-Taylor’s trench, with the intention of excavating the sequence of layers, down to the same level that Hope-Taylor had reached. Our hope was that in all likelihood many of these deposits would have extend into his excavation, greatly aiding our interpretation of Hope-Taylor’s surviving archive. The full extent of Dr. Hope-Taylor’s excavations had been revealed by 2002. 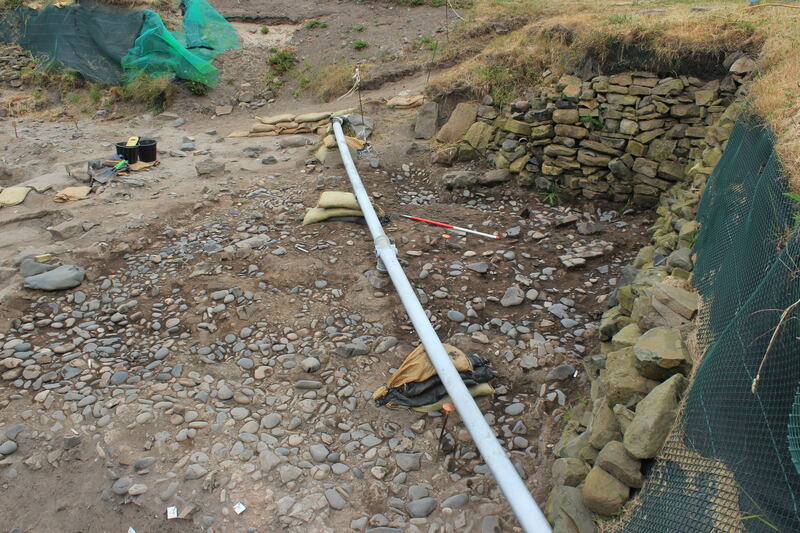 The removal of the trench backfill revealed a layer of plastic sheeting and fertilizer bags that had been laid in 1974 to protect the archaeology. When the plastic was removed we could see that Hope Taylor’s excavation had reached a feature dense area of early medieval industry with ash and burning together with a stone-lined water channel, perhaps indicative of metalworking. Hope-Taylor’s excavation methods could be clearly seen as many of his layer tags, grid pegs and baulks were preserved and it was apparent that he was not digging in the same open area style we use today. One of the more interesting features was an early mortar mixer that Hope-Taylor referred to as the ‘gin-gang’. 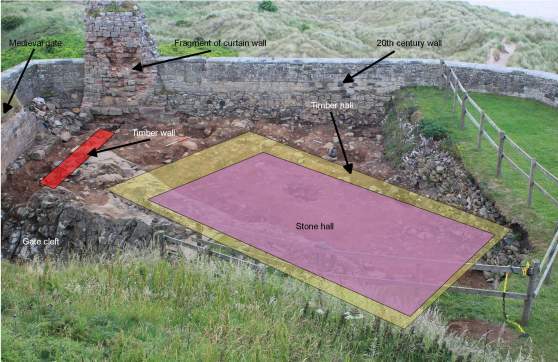 The mixer’s presence indicates the use of mortared stone buildings within the site in the early medieval period, direct evidence of which was encountered by the Bamburgh Research Project in the Inner Ward in 2004 and 2007. Our parallel excavation has demonstrated a full sequence of occupation that extends from modern layers, and down through a midden (waste dump) during the later medieval period, through to increasingly complex deposits as we encounter the layers that pre-date the Norman Conquest. The early medieval period is characterised by timber buildings with rubble foundations of various styles and sizes, from substantial halls to small workshops. There are pathways and cobbled areas and layer upon layer of ash from intensive industrial activity. Many of the deposits contain animal bone which provides excellent evidence of the diet of those who lived and worked in this area. A large number of small copper and silver-alloy coins, called stycas, have been discovered, scattered across the site, and these and other small finds offer the best dating evidence, until our radiocarbon samples are processed. We have identified a small stone-founded timber building that contained a hoard of these coins (in the photo above) and a scatter of many more on the surface around it. This strongly suggests that the building is of a similar date as the coins, and that is the later 9th century AD. The other small finds, when they can be dated, are also consistent with this, so we are reasonably confident of this dating. The building was likely used by metalworkers; in fact the presence of iron objects including two pattern welded swords found in the vicinity and small fragments of highly decorated gold may point to rather high status production. Hammerscale sampling has been conducted across the area, and this shows evidence of extensive smithing including high temperature welding consistent with the production of iron objects such as weaponry. The future plan for Trench 3 is to excavate it to at least the depth that Hope Taylor’s excavation reached, so we can finally have one large area of contemporary occupation open. At this point, the first phase of our excavation in the trench will be complete and publication will be possible. We have currently reached an earlier phase beneath the 9th century metalworking, likely 7th to 8th century in date (based on a limited sequence of radiorcarbon dates). We are now very close to reaching the same level as Hope-Taylor, but first we must properly understand a large area of cobbling that was uncovered in 2017 and 2018. At the moment we imagine we may be encountereing an earlier phase of industrial activity, but we will have to wait to see if we can demonstrate this during the excavation this summer. Deeper still we know that there is still a great depth of layers to be investigated in order for us to understand the Roman and prehistoric occupation of the fortress. So far we have only glimpsed these levels in the current trench, were modern distrubance and medieval midden pits have cut through into these earlier deposits. The 7th century cobble surface to be further investigated this summer. 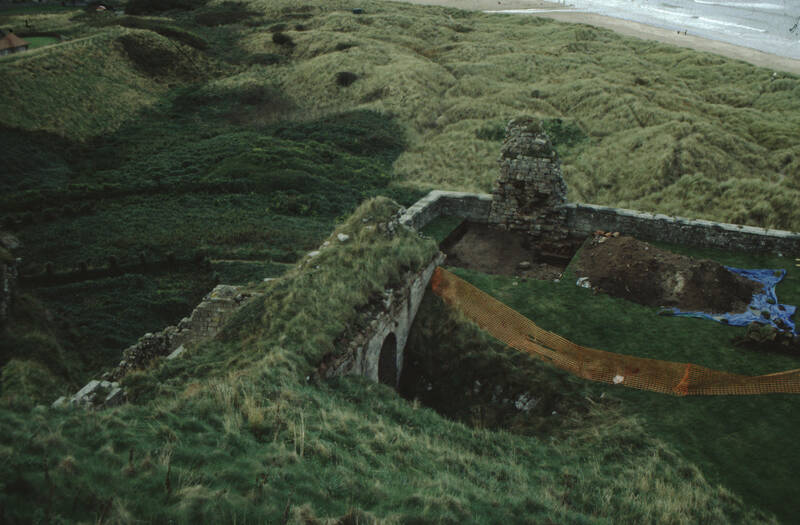 Trenches 1 and 2 were the first trial trenches excavated within the Castle by the Bamburgh Research Project. They were located at the far northern extent of the West Ward with the intent of investigating the defences of the fortress. Trench 1 was excavated at the base of a surviving stack of medieval masonry that had been built into the 20th century perimeter wall with Trench 2 to its north and east, at the northernmost tip of the fortress. Here it was found that before the modern preimeter wall was built the soil layers had been eroded by the weather, leaving little to investigate. In contrast to Trench 2, Trench 1 revealed deep archaeological layers and evidence of numerous defensive structures and buildings, from the time of the early medieval Northumbriam kings, to the later medieval castle. An important reason for placing our first trenches in this area was that we knew from documentary evidence (a monastic annals dated to 774 AD collated by Simeon of Durham in the 12th century) that the passage of steps leading to St. Oswald’s Gate was the early entrance to the castle. We even managed a small investigation in this area by lifting some of the late 18th century flagstones, leading to the gate, to reveal at least two phases of earlier surfaces, beneath which the bedrock was worn smooth, indicating an entrance in use for many generations. Over a number of years Trench 1 expanded from a small trial trench to become an open area excavation of some size, investigating the area from the defensive wall to St Oswald’s Gate. 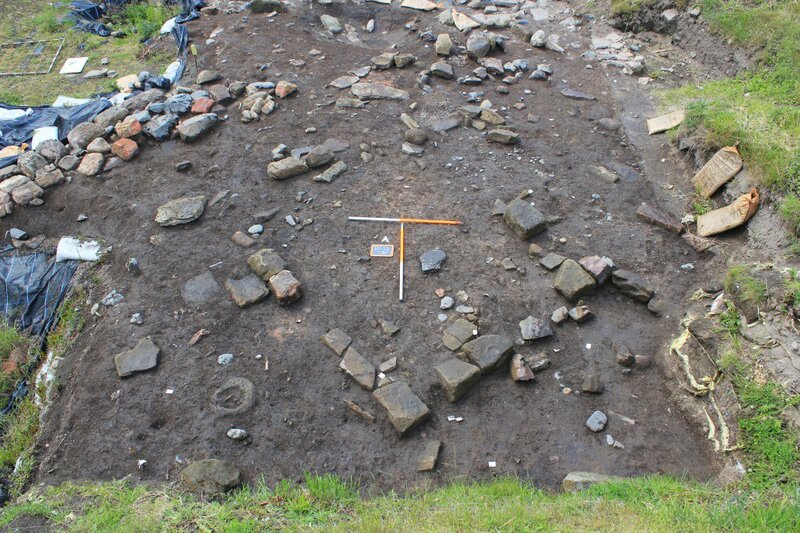 We identified evidence of buildings including two phases of a large early medieval hall that may have served as a residence for the castle gate wardens as its position alongside the entrance of St.Oswald’s Gate is ideal for controlling access to the west ward. 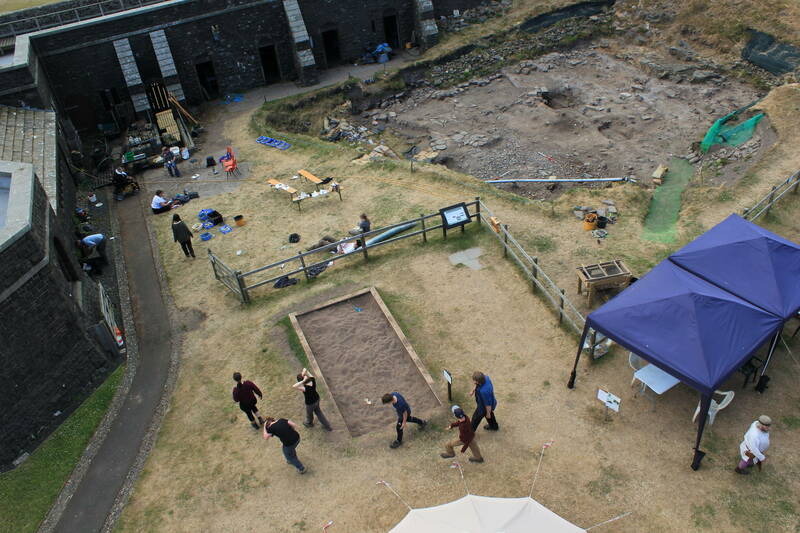 The beginning of Trench 1, located to investigate the standing medieval masonry. The first of the two halls was a timber building that we broadly date to the 7th century. It was later replaced by a smaller stone hall that went out of use by the 11th century, when its stone was robbed away for re-use. To the west of the halls and close to the modern wall of the castle, which also includes medieval elements built into it, we have found trances of what we believe to be earlier timber constructed defences. Structures like these are mentioned by Bede when he describes how Penda the king of the Mercians (a kingdom in the modern midlands of England) piled and burned a giant stack of timber at the base of the castle rock in a failed attempt to burn down the defensive wall. The excavation of Trench 1 was completed in 2017 and we are starting the long process of bringing it to publication. Trench 8 was excavated in 2006 and was our re-excavation of Hope-Taylor’s first major trench, excavated in 1960. Little survives of his site records from this early investigation, but we are fortunate to have a series of photographs and a detailed trench section, which is a wonderful example of his expert draftsmanship. We re-excavated the trench because it represented a full sequence of stratigraphy turf down to the earliest deposits above the bedrock, and it was also the location where Hope Taylor found two pattern welded swords! The small forge building (only a few metres away) in the south eastern half of Trench 3 may have been associated with this remarkable find. This section through the site stratigraphy has proved to be useful in making the link between our excavation and Hope-Taylor’s, and we were also able to excavate two baulks that Hope-Taylor had left in place in order to recover our own finds and samples. The stratigraphy revealed a considerable depth of occupation below the early medieval layers, with significant features and finds from the Romano-British periods including Roman pottery and below that, we discovered metalled surfaces of the prehistoric period. Trench 9 was the re-excavation of a further Hope-Taylor trench, that extended from the steps at St. Oswald’s Gate up the hill towards the windmill. Hope-Taylor’s excavation trenches were detailed on a plan recovered from his aprtment and provided to us in digital copy by teh RCAHMS in 2006. He had excavated a series of small trenches, Cuttings B, C, D and E, that radiated out from the windmill mound and Trench 9 was his Cutting C.
Re-investigating this trench was of particular interest to us as it extended as far as Trench 1 and so would add to our understanding of the archaeology of the St Oswald’s Gate complex. 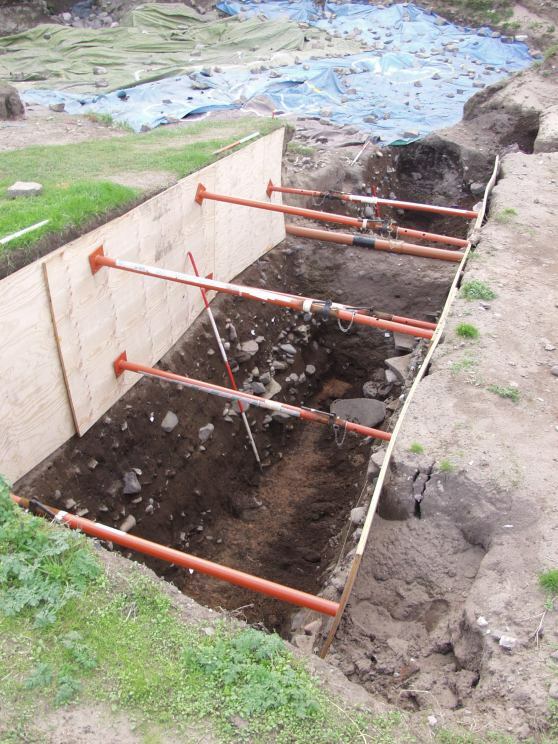 During investigation of one of the standing sections, we discovered a burial of partial horse and cow skeletons overlying the robbed out medieval steps, that had been deposited in the ground in the early post-medieval period. It is difficult to understand why such skeletal material was here, blocking the entrance, but it is just possible that it was associated with the occupation of Bamburgh by the Forster family, who owned the estate from the beginning of the 17th century to the middle 18th century and were known to be a somewhat colourful bunch. 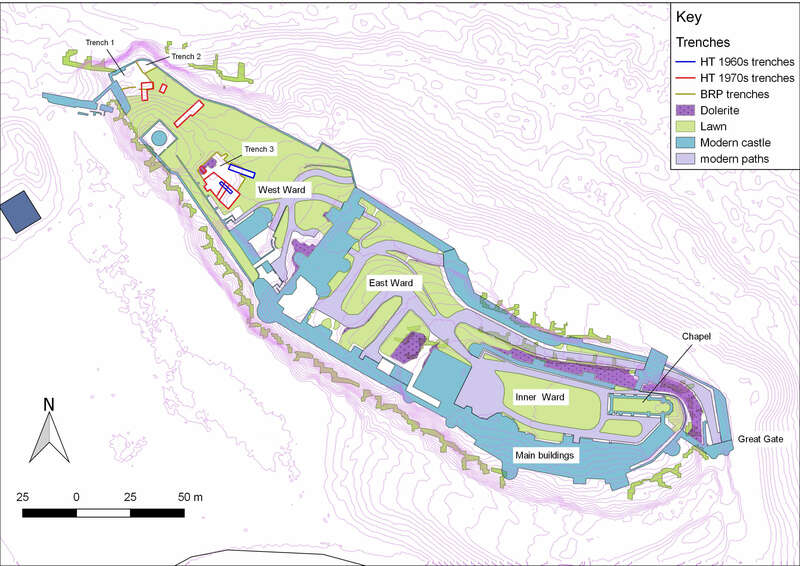 Ultimately, Trench 9 will be published as part of the Trench 1 report. We have also published numerous articles on the excavations. Please visit our Publication page for a full list.